Enjoying its North American premiere at the 2018 Toronto International Film Festival, Vox Lux features an all-star cast including Natalie Portman and Jude Law. The film is actor-turned-director Brady Corbet’s second feature, offering a riveting character study that spans decades of a young woman’s life as she catapults to pop stardom. Vox Lux has a distinct art house cinema vibe, which Corbet showcases starting from the very first frame. He has unconventionally chosen to have the films credits roll from the get go, offering a slow and somber start, setting the scene as his camera pans across small town middle America. One of the films most brilliant devices, which makes it feel like an old school storytime fable is Willem Dafoe as narrator. Vox Lux beings in 1999 with teenage sisters Celeste (Raffey Cassidy) and Eleanor (Stacy Martin), who have just survived a horrific school shooting at their small town school. The duo compose and perform a song at a memorial for the victims of the violent tragedy, which is watched live by millions in mourning. The somber yet hopeful song captures the hearts of a nation with its ability to offer catharsis after a catastrophe. The two girls are immediately thrown into the spotlight, their teenage dreams of being professional musicians immediately becoming a reality overnight. Their song immediately goes viral, capturing the attention of a music manager (Jude Law) who flies them to Stockholm to develop their first studio album. It’s here Celeste and her sister get thrown into an adult world they may not be prepared for. The innocent girls grew up in a good Christian home and without parents around to keep a watchful eye they start drinking and doing drugs while navigating Europe’s late night music scene. In the second half of Vox Lux, set in 2017, Celeste (Natalie Portman) is now 31 years old and the mother of a teenage daughter (also played by Cassidy with great effect). Celeste’s dialogue with her daughter, sister, manager, record label, and the media at large inform the audience of the stars downward spiral over the years. We learn she’s had a career fraught with scandals, many of which stem from her addiction to alcohol and drugs. Music fans should be aware that celebrated Australian songstress Sia is attached to the film as an executive producer, songwriter and composer of the films original score (alongside partner Scott Walker). Those who know Sia’s story are aware of the artists own struggle with addiction while traveling on the road performing to sold out crowds so it’s no doubt she’d be passionate about this project. Portman serves a polished performance as a woman whose downfall is attributed to the exploitation of her own personal chaos, while Law manages to be both endearing and disturbing as a father figure who forgets his professionalism at the front door of the VIP party. 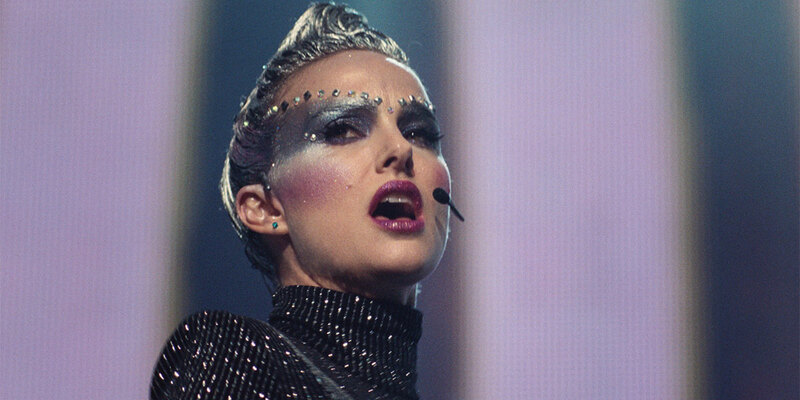 For millennial music fans who have grown up watching the pop star cycle rollercoaster, Vox Lux offers a cautionary “be careful what you wish for tale,” that reminds us of the tragic rise and fall of stars such as Lindsay Lohan, Britney Spears, and Amy Winehouse. Coming to Canadian theatres on December 14th.